What Are Those Weird Green Brain Fruit Anyway? This time a year, if you wonder around Montrose or Volta Parks you’re bound to find on the ground weird softball-sized green fruit like the one above. People are often so struck by the sight of the fruit, they pick up one or two of them and bring them home. But what are they, you ask? Despite their green color, they’re oranges. 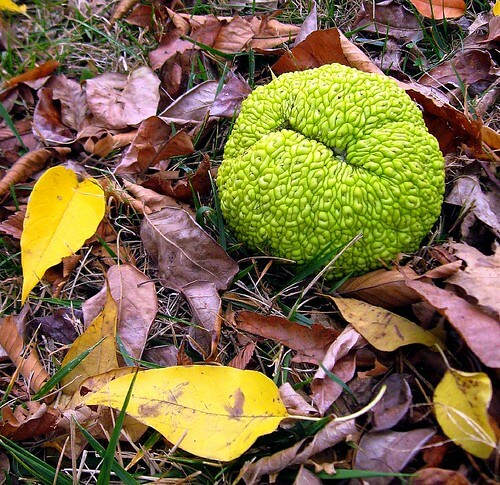 Osage oranges, to be specific. They are grown by Osage trees, which line the Parrot rope walk. These trees are prevalent in the Great Plains states, where they are often planted along hedgerows. Traditionally, the pliable but strong nature of this tree’s wood made it valuable for fence posts and archery bows. Technically speaking, the fruit is edible. But you can only eat the seeds, and they’re not easy to extract. GM heard once that people should not feel guilty about taking the fruit home since no animals eat them. GM finds that they rot after a month or so. But if you don’t want to keep them around, Amazon sells them for $35 to the dozen, maybe you can undersell them (besides being an interesting knick-knack, the fruit is believed to repel insects and spiders).